The most famous address in Washington is 1600 Pennsylvania Ave. But starting in late April the Trump International Hotel just down the street will be the most polarising—at least for foodies. The hotel was supposed to open with a Spanish-Japanese-themed restaurant from chef José Andrés, but after candidate Donald Trump denigrated Mexican immigrants as “rapists” while announcing his run for the presidency, Andrés, an immigrant himself, pulled out of the deal. Food Network star Geoffrey Zakarian, who’d been planning a bistro inside the lobby, followed suit. Since then, restaurateurs Stephen Starr, Tom Colicchio, and Bryan Voltaggio have all passed on the chance to open a spot in the historic Romanesque building. Yet where others saw a toxic brand, Alessandro Borgognone sensed an opportunity. The serial entrepreneur, who got his start at his family’s red-sauce joint, Patricia’s, in the Bronx, NY, loves taking risks. After seeing Jiro Dreams of Sushi, he contacted on a lark one of the documentary’s featured apprentices, Daisuke Nakazawa, about opening a Manhattan restaurant. 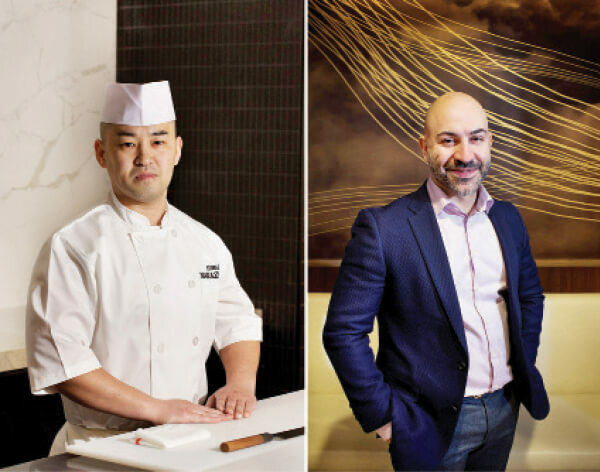 Since its debut in 2013, Sushi Nakazawa has been one of the hardest tables to get in New York. Reservations open at 12:01am. ; they’re gone by 12:02. But in a city where more than 90% of the population voted for Trump’s opponent, sentiment is more divided. Making matters worse, in late 2016, Borgognone gave an interview that called the District of Columbia a “meat-and-potatoes town”—even though Washington has been heralded as one of the most inventive dining cities in America. The menu will be similar to New York’s, including salmon smoked over hay, tuna three ways, and uni topped with white truffles. Toro will be featured as well, but at the DC location, it will be sourced from Fujita, the legendary purveyor inside Tokyo’s Tsukiji fish market. The restaurant will pay four to five times more for the toro than it does for “normal” tuna, but prices will be the same as in New York: The 20-course omakase will cost US$150 at the bar, where chefs provide direct interaction, and $120 in the dining room. Nakazawa won’t be behind the chef’s counter. Instead, the executive chef will be 36-year-old Masaaki “Uchi” Uchino, who worked as an apprentice under Nakazawa in New York. Nonetheless, Trump Jr sounds elated with the restaurant’s prospects. “Their Manhattan location is so special,” he wrote in an email. “I look forward to seeing how they will shake up the culinary scene in DC.” Others are sceptical. “I think there will be a large number who will decline to go because of their political viewpoints,” notes Washington Post food critic Tom Sietsema. The restaurant doesn’t feel like a Trump hotel, though. It has a separate entrance and its own bathrooms, and, whereas the hotel’s interiors are painted gold, the sushi bar’s décor suggests nature, with walnut and oak. Nakazawa handpicked the tableware, a form called Bizen-yaki, on a recent trip to Japan.